Bryan Fogel interviewing Russian anti-doping expert Grigory Rodchenkov during the making of ICARUS. Photo courtesy Bryan Fogel. WHY DO YOU THINK THEY CALL IT DOPING? 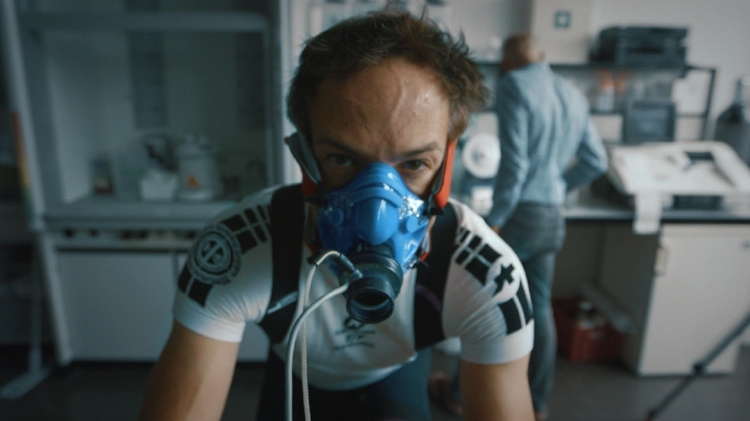 Oscar-Nominated Malibu Resident Bryan Fogel on His Sports-Doping Documentary Icarus. Originally from Colorado, long-time Malibu resident Bryan Fogel set out in 2014 to make a documentary about doping in sports - essentially a Supersize Me on steroids. But what began as a simple, personal quest to explore and expose sports doping morphed into something much larger - a story of international espionage and paranoia co-starring a Russian doping expert named Grigory Rodchenkov: A wild and crazy Russian anti-doping official who actually masterminded the Russian illegal doping scheme. Fate allied Rodchenkov and Fogel which resulted in the Russian loudly and internationally blowing the whistle on the ambitiously, joyfully corrupt Russian sports doping program - Olympics and all sports. Rodchenkov is now in protective custody, in America, hiding from Vlad the Poisoner and his henchmen. A long-time recreational and competitive cyclist, Fogel started off making a documentary about blood doping and gaming the system. Photo courtesy Bryan Fogel. Fogel’s Icarus premiered at Sundance in January of 2017 and got caught in a bidding war, with Netflix paying an unheard of $5 million for a documentary. Twelve months later, in December of 2017, the IOC banned the Russian team from parading in the Olympic opening ceremonies, or competing under the Russian flag. Icarus played an important role in exposing the Russian program and the ban. And now Icarus has been nominated for an Oscar in the Documentary category. On a perfectly sunny Wednesday in February, Fogel was at his home in a private location and sat down to talk. That’s a very dense documentary you have there, to say the least. What titles did you come up with before you decided on Icarus? Icarus was the first title before I ever picked up a camera. I came up with the name of the movie before I picked up a camera and started shooting. That was it from day one. Can you explain the significance of Icarus to those unfamiliar with Greek mythology? Well Icarus to me is a metaphor of being able to do incredible things as long as you don’t push the boundaries too far. And that story is about a father whose son wants to fly, and the father tells the son he can fly as long as he doesn’t go too close to the sun. Which he does and he crashes and burns to the ground. And to me that was the story of Lance Armstrong and was the story of many many athletes who necessarily were not caught for what they did, but essentially pushed those boundaries in other ways - through denial, by suing people and etc - and that kind of became the metaphor for really, the film. Was the documentary about Lance Armstrong, originally? It wasn’t about Lance originally, it was about what I perceived as the fallacy of the anti-doping system. I believed strongly and then in a year of research that I did before I started the film, the anti-doping system was essentially a fraud. If you couldn’t catch the most tested athlete on planet earth, after 500 tests, to this day he’s never clean… I mean he’s never tested positive to this day. What does this mean for global sport? What does this mean for all sport? And that was what I was out to prove and show and ultimately that Lance is and was a needle in a haystack in terms of global sport. Exactly. One of many and as the film uncovers a state-sponsored program truly shows that he wasn’t the, I guess, the Godfather as he was put out to be. He was the poster boy. It’s not the crime, it’s not the thought. It’s if you get caught. It’s an Oakland-funky 70s song and wouldn’t have been appropriate for the tone of your documentary, which is deadly serious - in more ways than one. Monday, February 12, 2018. Photo courtesy Bryan Fogel. Were you in the group photo of Oscar nominees they just did? Um yeah I mean it was an incredible honor and it was kind of surreal because they call you up one by one onto these risers. And it’s “Meryl Streep” and everybody starts applauding. They bring you up there and you’re just standing on these risers and for me it was about 10 minutes before they actually took the photo because they had to call everybody up there, and it was just a trip watching all these people I have so much respect for their craft and their work, coming up one by one. Did anyone approach you about Icarus and say how much they enjoyed it? Some people you probably wouldn’t know of. Visual effects artists who were nominated and sound guys who were nominated. But um, yeah had a lot of conversations with people whose work I’ve admired for many years. Where did they shoot it? At the Beverly Hilton. In the same room as the Golden Globes. The Oscar lunch was on Monday, so two days ago. If you had to choose between winning the Haute Route bicycle race you mention in Icarus, or winning an Oscar, which would it be? Icarus is a very dense documentary. A lot happens in two hours. I think you have been nominated not just for the importance and timeliness of the subject matter - and the effect the documentary has had on international sport and politics - but also for craftsmanship. Icarus started as a relatively simple idea and then it evolved as you were making it. You didn’t know where it was going but you stayed on top of it and detailed it as it was happening. This documentary is much more complicated than you could have ever dreamed. No, absolutely, I thought that I was going on a couple-year journey when I started that was going to be complicated in its physicality and also in the science of it. But certainly over what transpired there was a four-year journey. The story was incredibly complicated but crafting the narrative of it became an obsession for me as to how to tell this story, not in a flat-out journalistic point of view but to bring in a lot of artistry into telling that story which hopefully leads to the emotional impact of it. You could say, in a sense, that it’s Supersize Me on steroids? What was your inspiration for Icarus? What documentarians or documentaries did you have in mind? When I started out one of my favorite films, in crafting it one of my favorite documentaries of all time was Man on Wire. Because the film plays like a thriller. Plays like a theatrical scripted thriller yet it’s a documentary. And that film was very impactful to me in the crafting of Icarus. And this to me was going to be what the drugs do to you but the bigger perspective of whether or not the global anti-doping system in sport - works. And that was what I originally set out to show. Bryan Fogel in training for the Haute Route - a grueling, week-long bicycle race in France. Photo courtesy Bryan Fogel. Where is Lance Armstrong these days? I’ve got to know him through this. He came forward a couple months ago in strong support of the film. He was very taken by it. In his own words he was ‘blown away’ and I have sympathy for him in regards to what was a witch hunt to catch him. The Federal Government got involved in the criminal investigation and the only way they were able to catch him is because his teammates - who did the same thing as he did - ratted him out in exchange for their own immunity. So I have sympathy for him in the sense that he certainly was not alone. He did not invent the system and he came into a system in sport that was already corrupted when he began. So he clearly had… that’s what he came into. So I have sympathy for him in that regard, but I don’t have sympathy for him in the way that he treated others. And how he sought to bring others down. And that was ultimately his downfall. He kind of really pushed those limits in bringing lawsuits against other people. And seeking to defame other people, etc. So he’s a complicated character. Is Lance Armstrong as ruthless as Putin? I don’t think he’s as ruthless as Putin, no. I wonder: Why was Rodchenkov allowed to leave Russia and come and go as he was? Well he wasn’t allowed to come and go. When he came to Los Angeles the first time he had a visa. A US visa because he was lecturing at anti-doping and sports symposiums in the United States - before he fled the country. And when he fled the country he had that visa in place and he got out so quickly that I don’t think they had the chance to put that control in the system. I mean there are the allegations against him, he resigns from the lab, the lab is shut down and the Russians are dealing with this crisis. They think that Rodchenkov is still working with them and going to help them. And six days later he flees. It was six days later. He couldn’t take his family with him. Too suspicious. A: the gravity of what was going on in regards to the continued investigation and Russia’s response. And B: What became Grigory’s desire to bring forth this information - to truly become a whistleblower. And I think as he made that decision we certainly knew he wasn’t going to be returning to Russia. He must have been worried about his family? Was he? But they’re not in prison. No. But I’ve been told that they’re under… they’re keeping a watch on them. But Grigory’s lawyer would have more information on that than I do. I don’t know if it’s jinxy bad luck to ask this, but have you written your Oscar acceptance speech yet? Is that bad luck to ask? I don’t know if it’s bad luck but I think that’s something I’ll work on that day. So you had a lot of help on this project. You must have, because it’s a complicated thing. Who would you like to thank or mention off the top of your head. Well making film is a highly collaborative process and I think all great filmmakers - or any good film-maker - understand that it’s an army - a creative army of amazing people that help you craft your vision. So I was supported by amazing people through this process. How many did you have when you started? When we started it was me and my cinematographer and basically the two of us would bring on people as we needed it. In Year Two of this shoot it was me and my cinematographer and an editor and if you look at the end credits, there’s probably 500 people. Five hundred at the end? Yeah that worked on the film, sure. Did you edit on Malibu Road, where you were living during the making of the documentary? No we edited in Santa Monica. I had a whole team. I had about 15 people. Fifteen? When I was watching Stacy Peralta making Riding Giants it was just Stacy and his editor. Yeah you know but when you look at the production of the film. Every department once you get into post, there was a lot of people involved in this film. There are some very sophisticated graphics and also illustrations. Like the graphics about the twisting tops on the urine samples, etc. Yeah that was through a company called ODD in New York. And there was about 12 or 13 people who worked on that - compositors and visual artists and guys who can do CGI and all that stuff. Yeah, Jon Bertain. John’s incredible. I’ve never worked on anything as ambitious as Icarus but I’ve done video and film projects. I call editing “the one yard stare” and you live with that mammoth equation in your head - how to tell the story. Every day and every night you’re always thinking, and Jon is an incredible talent. You’re seeing stuff and thinking about it. The movie was all-consuming during the period we were making it. Stacy Peralta showed me the rough cut of Riding Giants just before he took it to Sundance. They missed a God-given transition from Act One - about Waimea Bay - to Act Two - about Mavericks. I begged him to change it, but it was locked. Oh well, they lit the place up regardless. Endings are tough, but you end Icarus with Grigory Rodchenkov reading about truthfulness from 1984 over images of Lance Armstrong and Vladimir Putin. It’s a great ending. Where did that come from? The 1984 reference? Well for Grigory, 1984 is his favorite book. It’s kind of been his textbook I guess I would say. And as myself and my team were working more and more with Grigory as he was here in Los Angeles he was always quoting Orwell. He was always quoting 1984. He was living it. He’s still living it. Yep, and he latched into Winston Smith’s journey, which essentially mirrored Grigory’s journey and as that became apparent we decided that could be potentially a structure. A narrative structure to hang the film on - Grigory’s journey. And that came through a long process. Before he went into protective custody we had him record many many passages from 1984 and we then had the ability to craft that narrative because we had those recorded passages. Last question: What’s next for Bryan Fogel? And that’s a question that could change dramatically depending on the outcome of the Oscars. I’m looking at a bunch of things. I haven’t decided. I have a couple of doc projects I’m looking at. I have scripted projects. Some stuff in the television space. I just want to get through the next month before I start looking seriously at those things. One more last question. When is the last time you spoke to Rodchenkov? Or is that classified? I’m not able to speak to Grigory anymore. And that’s been over a year now. I know that he’s okay - at least in health - but I don’t have any personal contact with him and I have no idea where he is. It’s serious business to anger Vlad the Poisoner. A good way to end up with Polonium-210 in your soup. Grigory Rodchenkov is now a wanted man in Russia - and is in hiding somewhere in the United States - or somewhere. Bryan Fogel has not communicated with Rodchenkov in more than a year. Photo courtesy Bryan Fogel.